It is fair to say that we have a slight obsession with the cocoon silhouette here at Style Arc HQ. Just when you thought we were done with cocoons we bring out a new twist on this shape and we are excited to share this one with you! 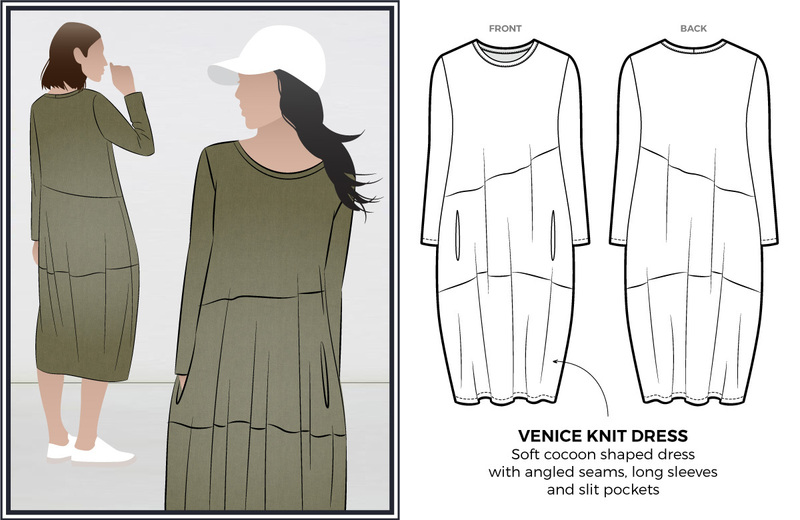 Our latest pattern release the Venice Knit Dress features a new pocket and some lovely design lines that complement the body nicely. Why do we love this shape so much? Let me tell you some of the reasons we gravitate to cocoon dresses – they can be dressed up or down depending on your accessories and footwear. When you are off to a wedding, a work event or lunch with the girls, the cocoon shape will fit the dress code nicely. Basically, this dress accommodates all body shapes and last of all, but the most important point is that it’s extremely comfy!